Oswego Speedway’s tentative 2017 schedule is set with several marquee events planned for the Novelis Supermodifieds, Pathfinder Bank SBS, Race of Champions Asphalt Modifieds, the International Supermodified Association, and the NASCAR Whelen Modified Tour. With a total of 12 weekends on Oswego’s 2017 racing calendar, each weekend will offer fans a special event feel, with three or more main events scheduled on five regular season weekends including welcomed guest appearances from the Race of Champions Asphalt Modified Series, and the International Supermodified Association. The Speedway will officially open its gates for racing on Saturday, May 13 with a three division show featuring kickoff events for the Novelis Supermodifieds and Pathfinder Bank SBS as well as the 61-lap Richie Evans Memorial for the Race of Champions Asphalt Modifieds. The Novelis Supermodified ‘Jim Shampine Memorial’ 75 and the Pathfinder Bank SBS ‘Tony White Memorial’ 35 will once again be on the Memorial Weekend docket along with the ISMA Supermodified ‘Jack Murphy Memorial’ King of Wings IX, making for 160-laps of action and the only time all season fans can see the Novelis Supermodifieds, ISMA Supermodifieds, and Pathfinder Bank SBS all in action on the same night. The ninth running of the famed King of Wings title event for winged Supermodifieds at Oswego will move for the first time to Memorial Day Weekend, adding yet another special layer to the schedule. A rain date of Sunday, May 28 will be implemented. Saturday, June 3 will serve as a rain date for any events left over in May. Racing in the month of June will consist of the Saturday, June 10 Novelis Supermodified Twin 35 special with a 30-lap main for the Pathfinder Bank SBS along with the first driver autograph session of the season. The Speedway will then take a two-week break for high school graduation and to allow weekly teams to fully prepare for a stretch of seven race events in nine weeks through the months of July and August. The Independence Weekend Grand Prix on Saturday, July 1 will open the month of July with 75-lap and 35-lap long distance events for the Supermodifieds and SBS, along with the Speedway’s popular Fourth of July Fireworks display. The 67th annual Race of Champions, the longest consecutively run racing event in the United States – behind only the Indianapolis 500, will move to July 7-9. 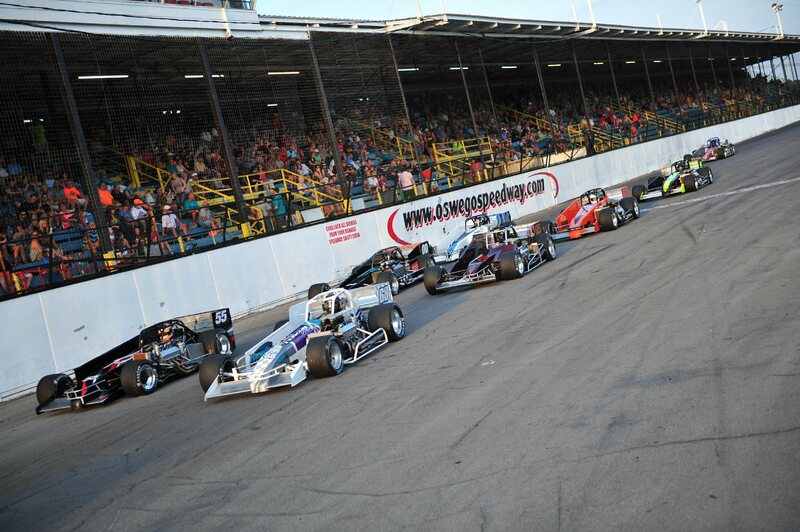 An open practice session will be held on Friday, July 7 with the RoC Modified Race of Champions taking place on Saturday, July 8 along with point events for the Novelis Supermodifieds and the Pathfinder Bank SBS. Further RoC event details, including additional divisions, will be announced in the coming weeks. The one-day blockbuster racing event will have a scheduled rain date of Sunday, July 9. The Novelis Supermodifieds and Pathfinder Bank SBS will once again provide a one-two punch during the Summer Championship on Saturday, July 15 along with the demolition derby before returning together for the 31st running of the $10,000 to win Mr. Novelis Supermodified and the 26th running of the $1,500 to win Mr. Pathfinder Bank SBS on Saturday, July 22. The $10,000 to win Mr. Novelis Supermodified will be a 75-lap affair after briefly returning to a 50-lap format in 2016. The stretch will begin with the Speedway’s Reunion Weekend on Saturday, August 5 which will once again see the return of Semi-Finals and a 45-lap feature for the Novelis Supermodifieds, as well as the Oswego Speedway Old Timer’s Reunion. The Pathfinder Bank SBS will then take center stage on Saturday, August 12 with Twin 20 feature events. The regular season championship will conclude with Speedway champions being declared during Track Championship Night on Saturday, August 19, prior to Classic Weekend, which will once again offer $5 admission for fans and a driver autograph session. The 61st running of Budweiser International Classic Weekend will again be a week-long line of festivities running from August 27 – September 3. Reserved Classic test sessions will take place daily on track along with the annual Racing Rolling Classic Bowling at Lighthouse Lanes on Wednesday, August 30 and the 11th annual Oswego Kartway Classic on Thursday, August 31. Competition will open for Classic Weekend on Friday, September 1 with open practice for the Novelis Supermodifieds and Pathfinder Bank SBS as well as ‘Fast Friday’ time trial sessions for Supermodifieds and SBS. On track action will conclude Friday evening with SBS heat races. By 7:30 p.m. on Friday the Speedway’s infield gates will open for the ‘Party in the Pits’ featuring live music and other activities. Classic Weekend’s ‘Super Saturday’ on September 2 will once again be a can’t-miss two division blockbuster seeing the return of the NASCAR Whelen Modified Tour, in a 150-lap contest, as well as the ISMA Supermodified Super Nationals 60 championship. ‘Classic Sunday’ on September 4 will not only feature the historic 61st running of the Budweiser International Classic 200 for Novelis Supermodifieds, it will also be paired with the 26th running of the Bud Light SBS Classic 75 – filling out a full day of competition beginning at 11:30 a.m., culminating with the International Classic green flag coming no later than 4:30 p.m.
Other special events on the 2017 Oswego Speedway calendar include the annual spring spruce up day on Saturday, April 29 as well as the Speedway’s season opening practice to be held Saturday, May 6.